The Untold Story of HIH Grand Duchess Tatiana of Russia. An epic drama of world-changing events revealed through the visionary consciousness of Tatiana, one of the four daughters of the last Russian Tsar, Nicholas II and his wife Alexandra. 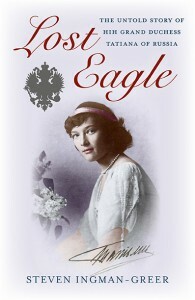 This is Tatiana's story, told through her diary: from idyllic childhood in the last royal family of Russia, to brutal imprisonment at the hands of the revolutionaries; from her last-minute escape and secret exile in England - for which there exists actual historical and documentary evidence - to her fulfilment in love and eventual tragic fate as she disappears from history under an assumed name. Within the storyline of history, Tatiana's passionate and impressionistic diary entries are set against the gathering storm of the revolution and the ominous indicators of the Romanov family's impending doom - and against the machinations of the British establishment which decided her fate. As a gifted child, Steven Inman-Greer was captivated by the Russia he discovered in Tolstoy’s War and Peace and went on to study Russian history and its classical music in depth. After a successful academic scientific career in Chemistry and Engineering he has become an expert on Imperial Russia and its last Tsarist dynasty, the Romanovs. He is currently teaching at the prestigious Dillington House and Higham Hall Colleges, and his adult-education lectures on the Romanovs have attracted ‘sell-out’ audiences around the country. He was a consultant for Rasputin, part of Channel Four’s 2002 Masters of Darkness series. An experienced broadcaster, his Glastonbury Radio weekly classical music programme The Eternal Muse has attracted a worldwide audience since the first broadcast in 2007. He lives in South-West England, UK.